I have always had trouble with my skin, every product I have used was too heavy, not heavy enough, too greasy, too scrubby, scratchy or too chemically. I hit a bit of a gold mine when I discovered natural skincare products, but this is not to say the problems had solved. I recently discovered Blue Labelle Botanic Skincare and couldn’t resist getting in touch! 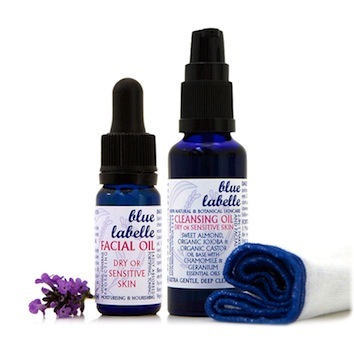 Blue Labelle is a company founded on the Isle of Wight, made by founder Pascale Labelle and is truly amazing. Everything I could want in a company, really! It wasn’t long before I purchased some products after Founder, Pascale’s advice on where I’m going wrong with skincare. I had put it all to the test. She advised me that most moisturisers leave my skin greasy because the binding ingredients in creams will only create an illusion of moisturisation whilst they sit on the skin, whereas facial oils will be absorbed by the natural oil layer on the skin, as well as this, normal cleansers will use scrubby or synthetic ingredients that will break down this natural oil, which is why skin often becomes oily or unbalanced throughout the day. Overall this has gave me about 2 months worth of skin care – bargain! I received my products within a couple of days of ordering, which is great for me as I’m stupidly impatient waiting for treats in the post! For all of you that also hate paying for delivery, I was delighted to discover that if you didn’t spend over £15 to qualify for free delivery, it was under £2 – that I could stretch to! I was eager to try my new oils. The cleansing oil needs to be used on dry skin, which I must admit is tricky when you’re in the bath/shower and prefer to cleanse in the morning, so be sure to keep a towel close by! I have actually switched to cleansing in the evening now, just because I have found it helps to balance my skin a little more. I found about 4 pumps is enough for me. The smell takes a little getting used to as it’s not packed full of perfumes, but is by no means unpleasant. Once your skin is dry it’s bizarre not to feel the ‘just had a face lift’ or ‘my skin is about to tear’ feeling that you normally get from mainstream face washes. Instead it feels super soft, moisturised and healthy – lovely! After using the cleanser I applied a few drops of the facial oil, the bottle suggested 4-5 drops, but I have since found that 1-2 drops is more suitable with the added bonus of making my products go even further! Since using the products I have had lots of compliments on my skin, that I’m looking very ‘matt’ – a definite compliment from another anti-shiny-face obsesser! I’ve been really pleased with my Blue Labelle products, and can’t recommend highly enough. Supporting an independent retailer – Pacale is a lovely lady! Corylus avellanna (hazelnut) oil, Oenothera biennis (evening primrose) oil, Juniperus communis (juniperberry) oil, Pelargonium graveolens (geranium) oil, Boswellia carterii (frankincense) oil, Limonene*, Citral*, Geraniol*, Citronellol*, Linalool*, Eugenol*. *natural constituents of essential oils. Prunus dulcis (sweet almond) oil, Ricinus communis (castor) seed oil**, Simmondsia chinensis (jojoba) oil**, Cymbopogon martinii (palmarosa) oil, Citrus aurantium (petitgrain) oil, Limonene*, Linalool*, Citral*, Geraniol*, Farnesol*. *natural constituents of essential oils. **organic. Evening Primrose Oil keeps us moisturised! ← Who is she? Who IS she?